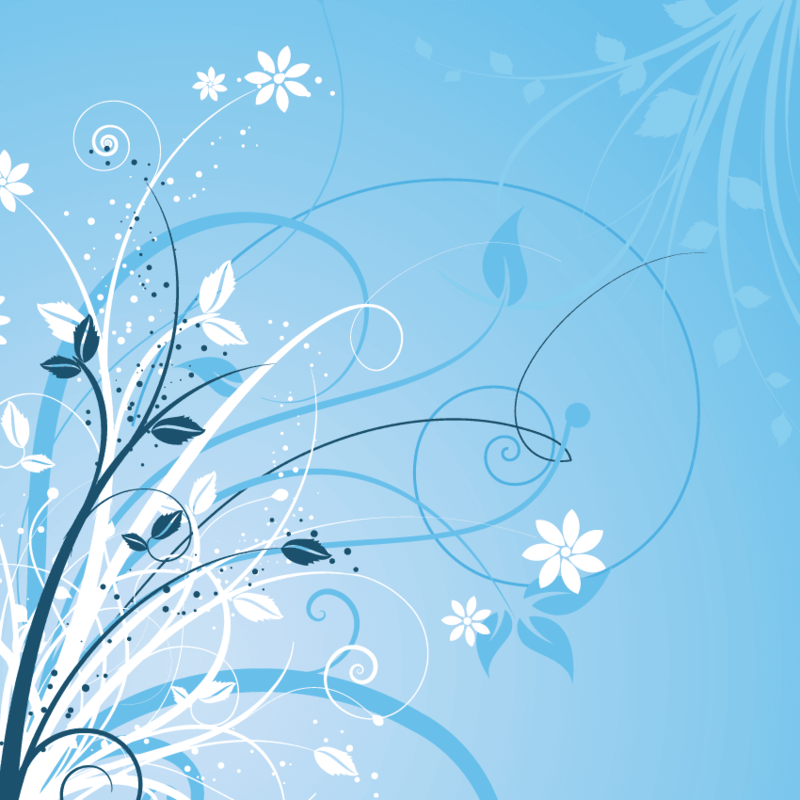 Do you like brand-new things? 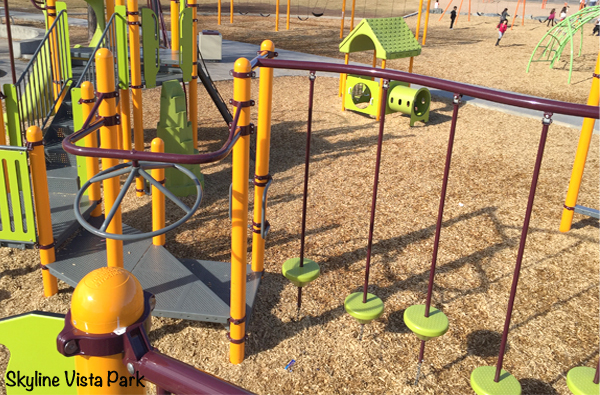 How about those freshly built play areas that still have that new playground smell? Look no further than the 8 public parks described in this article. The long history of public parks in Colorado began with Denver’s City Park in 1878. 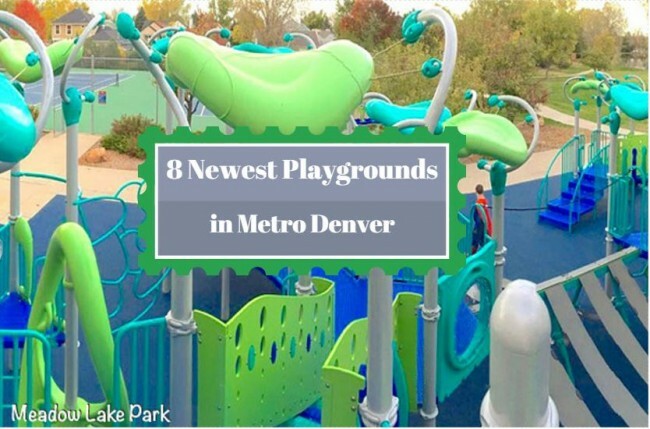 Today, there are hundreds of public playgrounds in the metro area and more are being built every year. I recently completed a survey of 737 play areas from Golden to Aurora and Broomfield to Centennial. 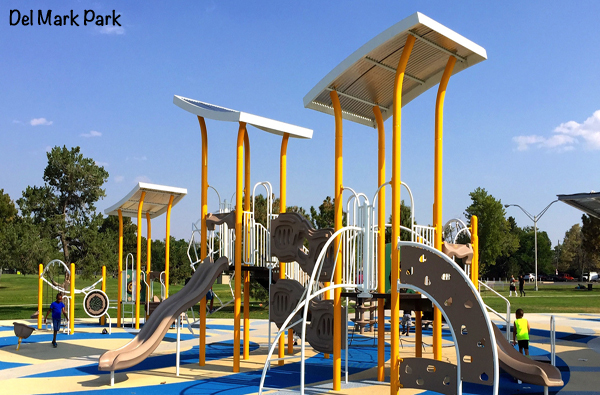 Get additional ideas from my guide Denver Playgrounds & Parks, available as a book and iPhone app. The book is sold at Amazon and at local stores such as Timbuk Toys, The Bookies, and The Tattered Cover. For details, visit my website playgroundsdenver.com. Looking for a colorful, unique playground by a scenic lake? 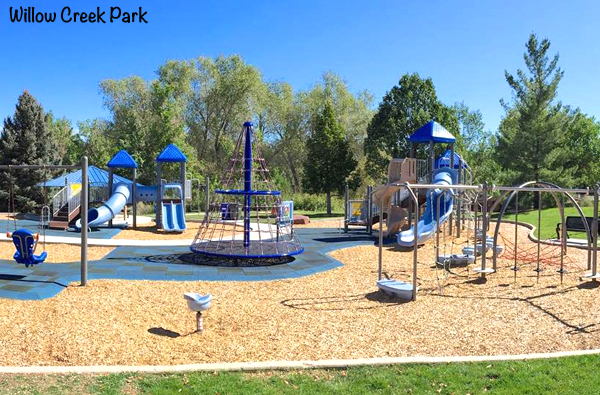 This recently built pond-themed play area features flat ribbons for climbing or sliding, a stand-alone tunnel structure, twisted climbing ladders, and a nice cage spinner. The tiny seats beneath the ribbons are great for little ones, while older kids can balance on the beam above. 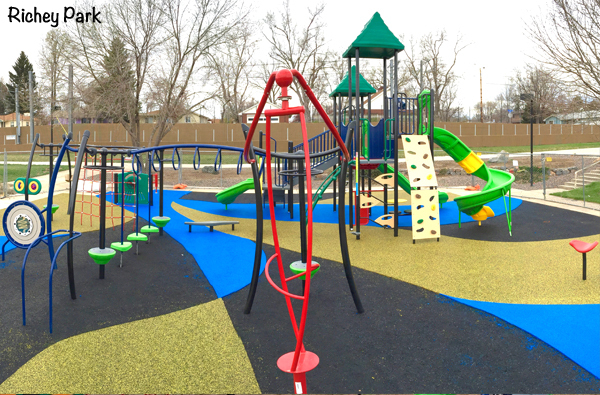 Brand-new for 2016, this playground in Lakewood is as colorful as it is fun. A lot of equipment is packed into a small space, from spinners to climbing nets. Located right next to the W line, the kids can watch light rail trains zoom by every few minutes. 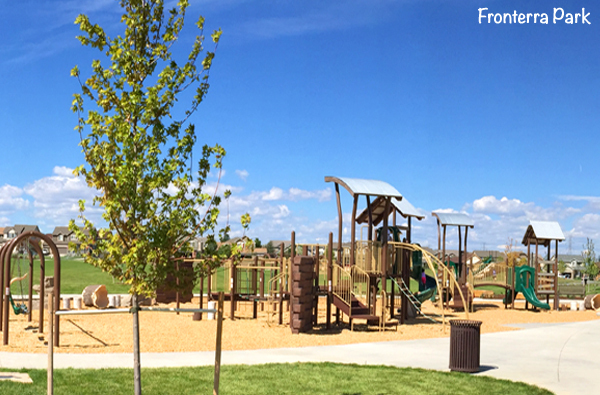 Find everything farm-related at Arvada’s newest park. A huge barn play structure greets you, complete with a chicken coop and conveyor belt. 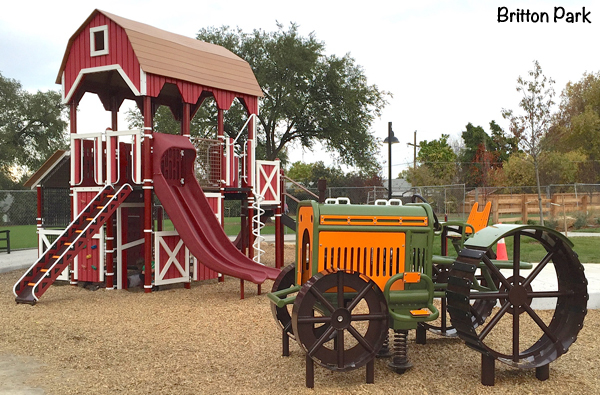 The play tractor moves on springs, and there is a separate play area for toddlers. This new Aurora playground features many different kinds of spinners, including a giant inclined platform spinner not found anywhere else. Climbing nets, ladders, and a separate climbing structure add fun to this play area. Nearby you will find a water park, tennis courts, and volleyball. Commerce City recently built this playground on the prairie, adjacent to the Second Creek Open Space. There is a slide built into a hillside, log tunnels, a huge grassy field, and a small skate park. You will also find plenty of climbing opportunities and an adaptive swing with a safety bar. 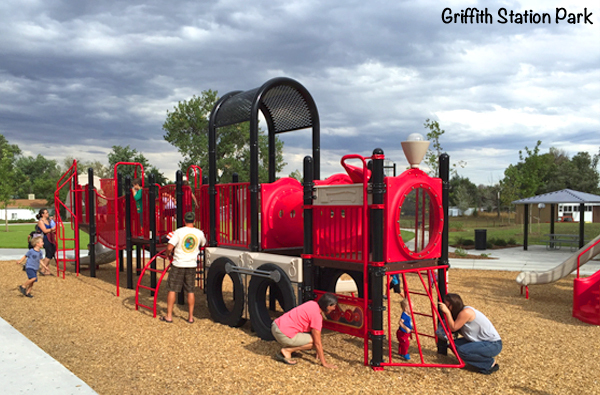 The theme here is trains and this new Arvada park is actually situated near an old trolley car route. There are imitation rail tracks on the sidewalk, play equipment modeled on trains, as well as lots of slides and a shelter in the shape of a trolley station. Recently replaced, this colorful Westminster playground boasts a large climbing structure, a flywheel spinner, and a lot of swings. There are also fun pivoting monkey bars, a platform swing, a play house, and a balance beam. Expect elementary school children to be on the playground when school is in session. A giant insect head welcomes you to this large playground. It offers fun features such as a Christmas tree-shaped cage spinner, climbing nets, a long row of stepping stones, musical instruments and noise makers. You will find spinners, an adaptive swing, and Willow Creek and its bike path nearby. Guest blogger Chris Sekirnjak has lived in the Denver area since 2004 and currently resides in Applewood (Wheat Ridge) with his wife and two young children. Outdoor fun has been his main form of entertainment ever since he was a little boy growing up in Austria. His two guide books Denver Playgrounds & Parks and Run, Stroll, Hike were published in 2014/2015 and have recently been adapted to iPhone apps. Very very cool! Can’t wait to check them out. Great list. I’m so sharing this with friends and hitting them all this summer. So over this snowy weather!